Adriaan Reelant, De religione Mohammedica libri duo (Utrecht, 1717). Throughout the Middle Ages Islam had been the great "other" to European Christianity, as its main, and usually more successful, competitor. The animosity against Islamic civilization was such that even when translations of the Quran began to be printed in Europe by the Protestant Reformers - the first Latin translation appeared in 1543 - they were usually published with a commentary refuting Islamic doctrines. It was not until 1705 that the Dutch scholar Adriaan Reelant published the first edition of this book, the first European work to attempt to describe the Islamic religion in a relatively objective way. It consisted of a translation of a compendium of Islamic theology and a systematic attempt by Reelant to dispel popular misconceptions about the religion. 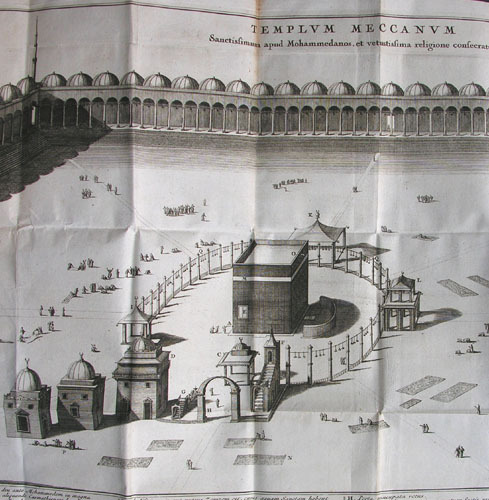 This plate first appeared in the second edition and is the first accurate attempt to portray the Great Mosque in Mecca published in Europe. The detail here shows pilgrims visiting the Kabah.